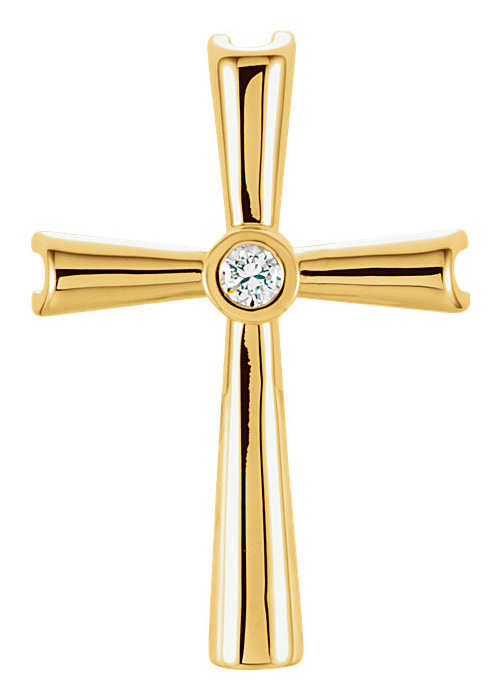 The "As Many As Received Him" diamond cross necklace from Apples of Gold Jewelry is created lovingly from 14K yellow gold and features a stunning diamond in the center of the cross pendant. The pendant, which measures 0.83 inch tall and 0.55 inch wide, features four arms of the cross that get wider as they move away from the center of the cross. At the center of the cross is a beautiful, single diamond, which is rated G-H for color and I1 for clarity. The diamond is 0.04 carat. This beautiful yellow gold cross pendant features a hidden bale behind the cross, which is perfect for your choice of chain. "But as many as received him, to them gave he power to become the sons of God, even to them that believe on his name:"(John 1:12). We guarantee our As Many As Received Him Diamond Cross Necklace to be high quality, authentic jewelry, as described above.